How much soil to fill a Raised Bed? Filling our new Raised Bed in the sunshine! 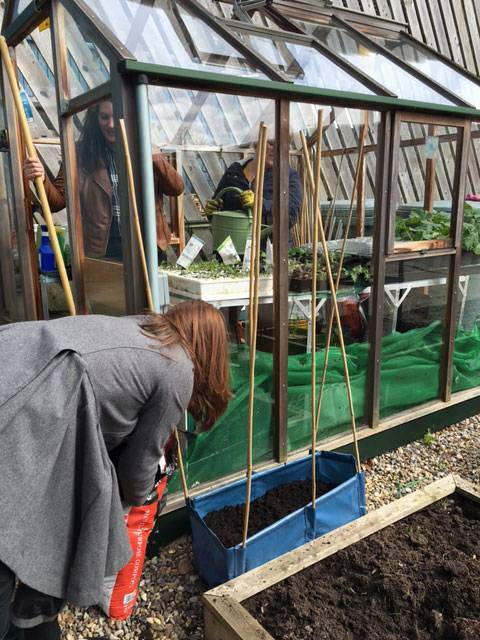 The weather was on our side this week as the Customer Services Team managed to spend a productive morning in the Harrod Horticultural HQ garden in glorious sunshine – the autovents on the greenhouse had even opened!! 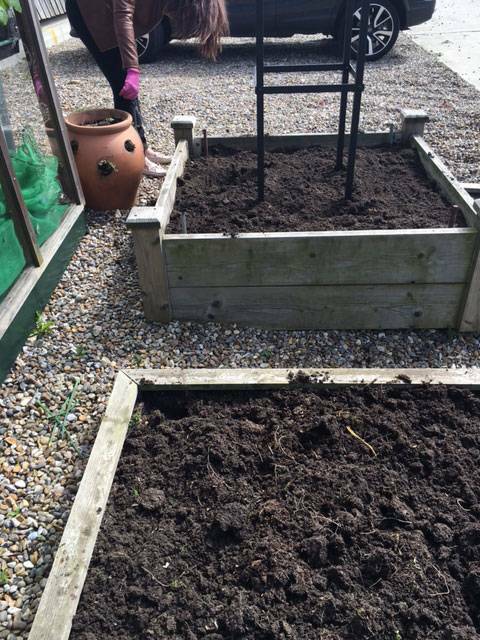 After building our new Standard Raised Bed a couple of weeks ago it was time to put it in situ and start filling it. 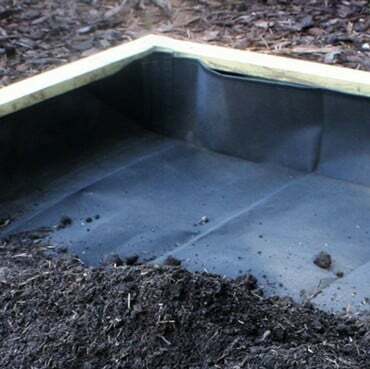 We are using one of our strong raised bed liners, not only do they protect the wood of the beds, but can help retain moisture and nutrients in the soil which can leach away over time. The liner was easy to fit and then began the harder work of filling the raised bed. It’s always surprising how much soil it takes to fill a raised bed and it took a little longer than expected, but we got there in the end and now the bed looks great and all ready to plant. How much soil do I need for my Raised Beds? 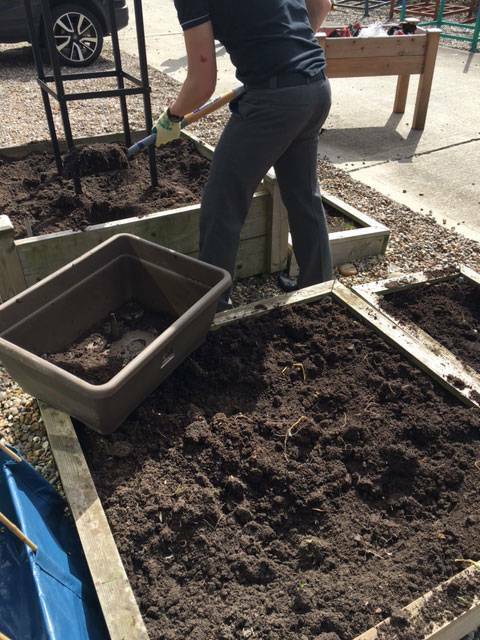 To calculate the amount of soil you will need for your Raised Bed, measure the dimensions of the bed and the soil depth you require. This is easiest in metres as it will give you the cubic metre volume required. 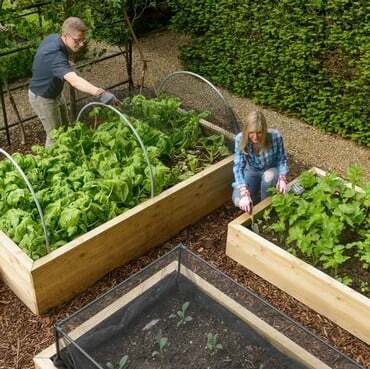 For example: Raised Bed Measures 1.2m (4ft) x 2.4m (8ft) and the soil needs to be 30cm deep – the calculation would be: 1.8 x 2.4 x 0.30 = 0.896m3 – so a 1 cubic metre bag would be enough. Once you know the volume in cubic metres you can calculate how many bulk bags are needed by dividing by the volume in a bag. Bulk bags can vary in size, so it is worth checking how much is in a bag when comparing different products. 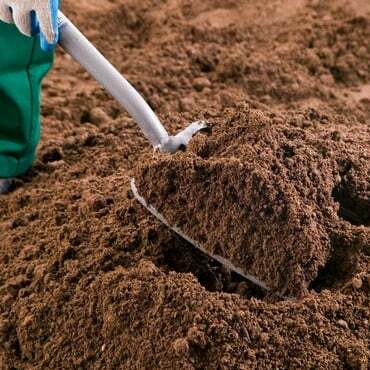 There is also a handy calculator on our Topsoil and Soil Improver page. So with the raised bed in place and the other beds tended ready for plants it was into the greenhouse to check on the progress of our seedlings. The courgettes are still going mad, having potted these on twice already, and are thriving in the greenhouse. The squash, peas, kale and spinach are all doing well and the tomato plants are really getting going now the weather has warmed up a bit. The weather is a bit confusing at the moment with some glorious sunny, almost warm days, and then a change of wind direction and the temperature drops and there is an almost wintry feel to the air. We have been wary of planting anything out until the threat of frost has passed, but looks like this may be a little longer yet as the mercury is set to drop again this weekend! All in all it’s been a productive few weeks and we are definitely learning and improving each year, and hoping for even bigger and better harvests – we’ve already had some spring onions which quickly got snapped up when left in the staff kitchen!